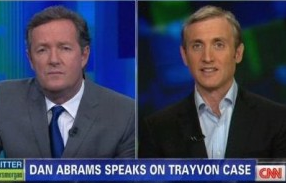 Dan appeared in a string of conversations with Piers Morgan on Piers Morgan Tonight on the topic of Trayvon Martin and George Zimmerman’s potential arrest. Followed by a more heated interview with Toure, Dan served to explain some of the legal issues relevant to the case. Of particular interest was Florida’s controversial “Stand Your Ground” law. Morgan asked Dan if he thought Zimmerman should have been arrested that night, based on all the evidence presented so far. While admitting that he does “expect an indictment” to emerge from this case, “I fully believe that we should let the system work and not call for an arrest today, and see what happens, because I expect to see this happening there in the very near future.” For the full post on Mediaite and a link to the video discussion, click here.